Correspondence regarding the Epping Motor Coach Works, 1956. Homepage. This page: The AA replies to a member concerning a complaint made about a garage. Complaint made re: Epping Motor Coach Works in 1956. 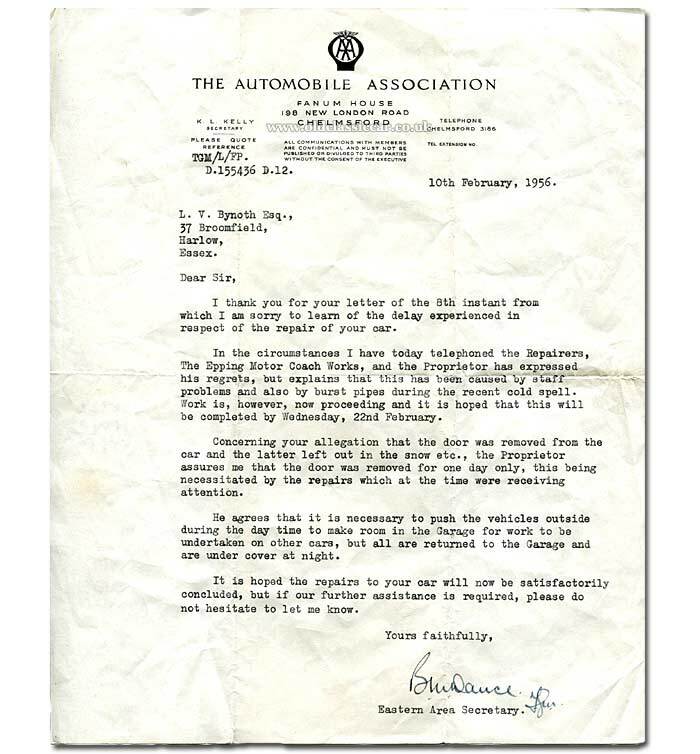 Clearly there had been ongoing correspondence already, between the AA (Automobile Association) and this particular member, prior to this letter being typed up and posted on 10th February, 1956. The complainant, a Mr Bynoth of Harlow, Essex, evidently was less than happy with aspects of the service he'd received while his car was in for repair at The Epping Motor Coach Works. Repairs to his car (alas no specific information is given) had been dragging on it seems. The Secretary at the AA had been in touch with the garage concerned, and established reasons for the delays. "Staff issues" are given as one cause, while burst pipes experienced during a recent cold snap had also hindered progress, according to the garage. The exact nature of the repair work being undertaken isn't documented here. The car's owner though was less than impressed that the door had been removed from his car, and had - he claims - been left out in the snow for a day. Presumably his concern was for the interior door trim being exposed to the elements, rather than the exterior paint finish. Reading between the lines, the car must have gone in for bodywork repairs following either a side-on impact, or a glancing blow that had damaged the door, or perhaps its mountings. Mr Bynoth also questioned why the car had been left outside during the working day. This was to enable work to progress on other cars in the workshop, is the reply. I remember having similar discussions with a company, when a vehicle of mine was entrusted to their care. One day I called in, to find the part-dismantled vehicle sat outside in the rain, the engine fully exposed and the spark plug recesses along the top of its rebuilt engine (it has a sidevalve engine) full of water. I wasn't too impressed, and roped in a few people to push it back under cover, after which I dried the engine down myself. If the weather was wintry in February 1956, as this letter indicates, then I can understand this car's owner also being underwhelmed at seeing his part-dismantled car sat outside. It's a shame that more information regarding the car, and the repairs that it required, aren't known. A check online shows that Mr Bynoth's then-home in Harlow is still standing, and probably looks much the same as it did back in the 1950s, bar modern uPVC windows. Precious little information regarding The Epping Motor Coach Works can be found online. This letter infers that it was an AA-approved repairer. A look at the following year's AA Handbook (1957-1958 edition), only shows two approved repairers in Epping though - F.G. Smith Ltd (Austin Morris Wolseley agents) on the High Street, and Tower Street Garage (Hillman Humber Sunbeam agents). There's no mention of the The Epping Motor Coach Works, nor is there in nearby Harlow, where the car and its owner actually lived. Bynoth isn't a surname that I've encountered before. Perhaps one day a family member related to Mr. L.V. Bynoth will find this page and drop me a line, hopefully with information on the make/model of car his relative may have owned in the 1950s. Stranger things have happened. Broomfield in Harlow has a CM20 postcode, and at least one person with this surname also lives at a CM20 address, so could well be a descendant. More items of paperwork relating to vintage vehicles, garages, sales agents and other vehicle-related services can be found in the Motoring Collectables section.